With hundreds of different models available, picking up the best Olympic weight bench can be a real struggle. Especially if you have never bought one before. Well, in this post we are going to tell you what you need to consider before buying your new Olympic weight bench and how to pick the one which is right for your particular needs. 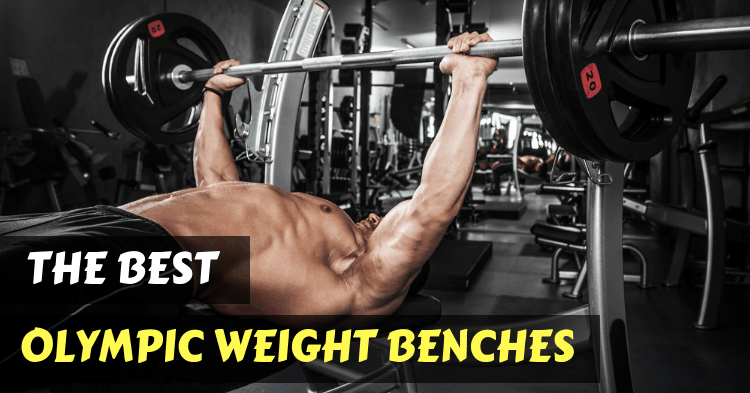 Additionally, we reviewed the top 5 of the best Olympic weight benches you can buy in 2019. 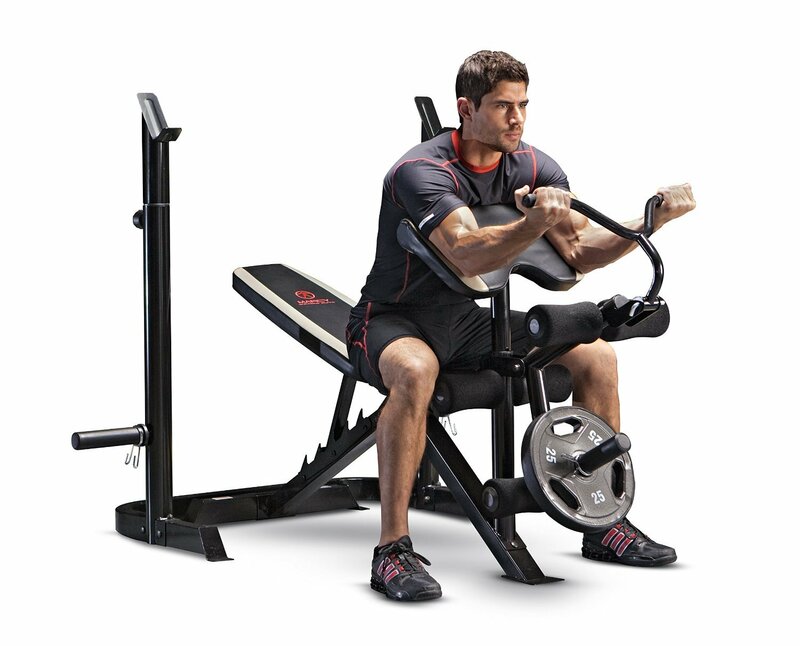 The BCB3780 model from Body Champ is an Olympic weight bench which will give you plenty of exercise options. The bench itself has multiple inclines and decline positions (besides the flat one) which will allow you to get a good chest workout. You can also have it set vertically if you want to do overhead shoulder press or seated bicep curls for example. This bench also offers the option to do leg extension. The foam rollers are a bit thin though, so if you are going heavy you might feel some discomfort around the ankles. The rack comes separated from the bench which has advantages and disadvantages. The good part is that you can use it as a squat rack, but on the downside, it is not as stable as you may want it to be. So there might be situations where you don’t really feel that confident when you’re re-racking the weight. The bench is also a little bit tall, so even if you’re average height, you might not be able to reach the ground with your feet while doing chest press. This will definitely be inconvenient since many people use their feet to balance their body when they bench press. Taking the BCB3780 one step further, the guys over at Body Champ designed this new Olympic weight bench and added a preacher curl to it as well. So with this item right here you can get a full chest workout, as well as hit your shoulders, quads, and biceps. All on one single machine. The rack is not detachable anymore, which means you can’t use it for your squats, but it is much more stable and secure now. The bench is very stable and doesn’t wobble around at all. The package also comes with the option to perform abs crunch with foam grip handles and an included hook attachment. The overall build quality is good and all the parts seem sturdy and comfortable to use. The leg extension foam rollers again are not the best, so that’s something that you might have some troubles with. Another downside is that this bench will take you at least a couple of hours to put together if you are a good DIY person. There are a lot of parts you need assembly and the instruction manual is pretty thick. At least it’s a one-time hustle. 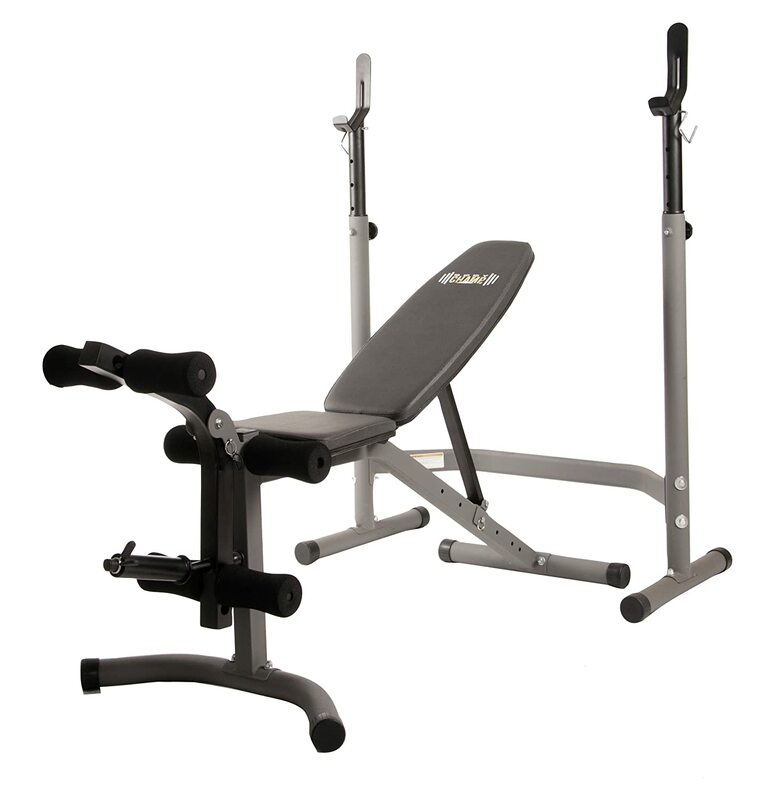 The Marcy Diamond Olympic weight bench will give you plenty of exercising options. The highlight feature is the preacher curl pad which can be detached if needed. If also comes with a stand-alone adjustable weight rack which you can use as a squat rack for building up your legs. We were impressed by the stability of the rack which is way better than in most similar products. Besides hitting the chest, you can also use the bench for leg extensions and leg curls after removing the preacher curl pad. It can be removed really easy, by simply twisting a knob. So you can literally get a full body workout with this piece of equipment. The overall built quality of the bench is pretty good, everything looks nicely put together and it feels like a premium product. On the downside, the bench doesn’t actually sit 100% flat, it has a very mild incline – maybe 5 or 10 degrees or so. Additionally, several users have reported that they received packages with missing parts or a damaged product. As the name suggests, this Olympic bench comes with a leg developer attached to it. The leg developer has a standard plate holder and it will allow you to perform leg extensions and leg curls. The pads used for the leg developer aren’t too comfy though. The bench itself can be set completely flat or in 3 different incline positions. It doesn’t have the option to use it as a decline bench. The weight rack will hold 6’ and 7’ bars and it is attached to the bench. You will not be able to use it as a squat rack. This gives the bench more stability though and this thing doesn’t wobble at all, even if you are using heavy weights. There’s a little bit of a gap between the seat and the backrest of the bench which will feel a bit uncomfortable when you are doing flat bench press exercises. This problem goes away when using it for incline bench press and leg extensions. Taller users have reported that the bench feels too small for them. As this is a space-saver model that doesn’t come as a surprise, but if you are over 6’ you might want to consider a regular size model. This one is a great budget Olympic weight bench for anyone who is looking to put together a little home gym. As we’re writing this the bench costs just a little bit over $100. It can be used for incline bench press using 5 different incline positions, as well as for flat bench press exercises. The rack is attached to the bench and feels secure. 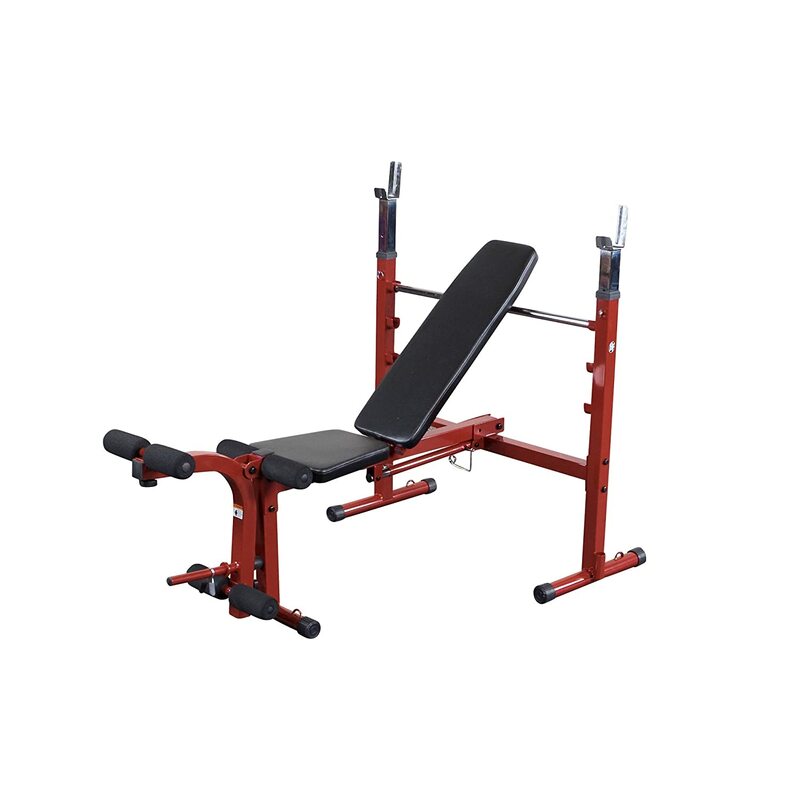 This bench comes with a leg developer as well which has a standard weight holder. You can use it for leg extensions and leg curls. The foam rollers are surprisingly good for the price and the padding used for the seat and backrest are decent too. 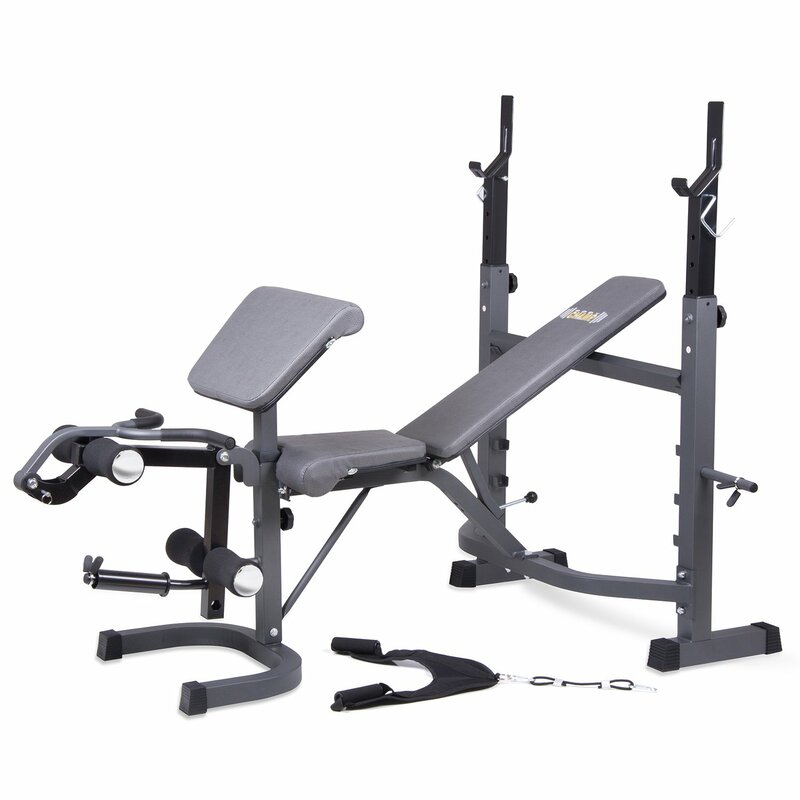 The Marcy Pro bench can also be declined, unlike other more expensive models, so that is definitely a big plus. Being a budget product, as you would expect it has its flaws such as poor paint job, it gets shaky if you use 225+ pounds and the overall built quality could be better. Turning 180 degrees from the budget Marcy Pro CB-729, the Valor Fitness bench falls into the premium category and will cost 3 times as much. This bench will look like a tank when you put it next to any of the other benches we reviewed above. It is made out of 4”x2” steel whereas the competition usually uses 2”x2” or 2.5”x2.5”. So it’s a really solid, sturdy bench which you will able to use no matter how strong you are. It can only be used as a flat bench, so there’s no option to use it as an incline or decline bench and there’s no leg developer, preacher curl pad or any other accessory. It does feature a spotter stand and safety catchers in case you don’t have anyone to spot you. So it is definitely designed for heavy lifters. Taller users reported that the weight rest position is too low and you might end up putting the bar over the top rest position. An Olympic weight bench is definitely a must-have for any home gym owner. We actually look at it as the most important piece of equipment in a gym. So there’s really no question of you need one, but which one to buy. And if you still didn’t make up your mind, here are our top picks for the best Olympic weight bench. For beginners and even intermediate lifters, our pick would be the Marcy Pro CB-729 – Competitor Olympic Weight Bench. It is cheap to buy, it offers plenty of exercise options and will give you the best bang for your buck. 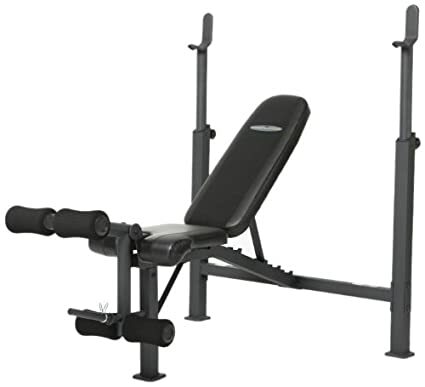 If you are an advanced lifter and you have more money to spend as well as more space available for your home gym, then the Valor Fitness BF-48 Olympic Bench might be the right one for you. The built quality of this one is amazing and you can go as heavy as you want with no risks thanks to the safety catchers. An Olympic weight bench is probably the core piece of equipment in any gym and a must have for any resistance training routine. Bench pressing is one of the key compound movement for developing the upper body and there is no workaround to replacing it with anything nearly as effective. Additionally, many of the Olympic weight benches are multifunctional and they will allow you to perform a variety of different exercises such as leg extensions, bicep curls, overhead shoulder press or abs crunches. Here are the top characteristics you want to consider before buying your Olympic weight bench. Space is most of the time limited in a home gym. 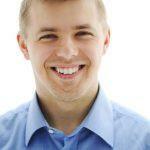 So ideally you want to be able to use the same equipment for a variety of different exercises. That way you will save up both floor space and money. 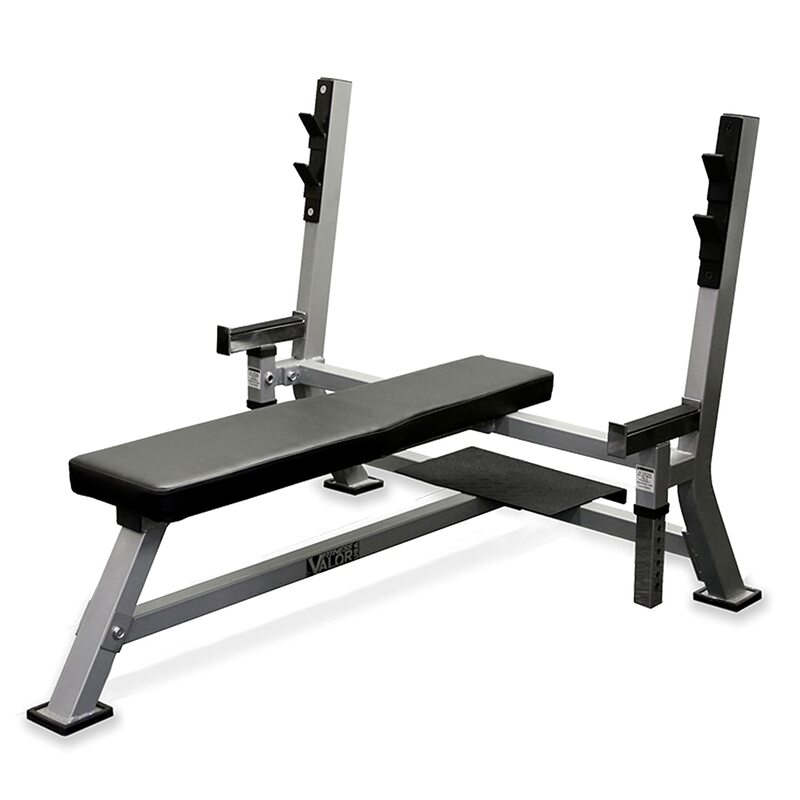 Olympic weight benches are probably one of the most versatile types of equipment you can buy. Some will offer you a full body workout, but some can be used just for flat bench press. So depending on what you are after, keep an eye out for what other exercises you can use it for. Most Olympic weight benches can be used both as incline and flat benches as well. Incline bench pressing is actually more beneficial than the flat bench press, so definitely pick a bench which can be inclined. Some can be declined as well. Additionally, you can buy an Olympic weight bench which comes with a leg developer as well. These will use a standard plate holder and they will allow you to do leg extensions and leg curs. Some have a detachable weight rack which can be used as a squat rack. Lastly but not least you have Olympic weight benches that come with a preacher curls for training your biceps. Generally speaking, the more versatile a bench is, the lower the built quality tends to be. Benches that offer a wide variety of exercise options might be a good pick for beginners that are just starting out and don’t want to invest that much money in their home gym setup, but still want to be able to perform different exercises using less equipment. If you are a seasoned lifter you will want to get dedicated equipment or machines for different exercises. The built quality on each of these will be better and you will feel safer using more weight, which brings us to the next point. The exercises performed using a bench press are can result in serious injuries if you the equipment you use is not properly designed or used. With that in mind, you want to pick a bench which feels sturdy in general. The weight rack should feel secure and it shouldn’t wobble too much when you rack and un-rack the weight. The backrest should wide enough to offer enough support while you work out and the seat should be positioned at the right height. You should be able to firmly reach the ground with your feet and balance your body weight during your set. If you can buy a bench which comes with safety catchers definitely go ahead and do it. These will be more expensive though and will not be as versatile when it comes to exercise selection. The vendor will include the maximum load capacity for their models. From our experience, this can go from just 300 pounds up to 1,000 pounds. Depending on how heavy are the weights you plan on using, make sure to check out the specs and filter out the benches which don’t fit your needs. Be careful, the maximum load capacity includes the weight of the user as well. Our recommendation is to go with a model which offers a maximum load capacity which exceeds at least 25% the maximum weight you will be using. Lastly, you want to check out the overall built quality of the bench. Take a closer look at the parts that are likely to wear out quickly such as the foam rollers or the padding used on the seat and the backrest. A good welding job is equally important.